Looking at the collective research agenda for historians of church architecture, the church buildings of the second half of the twentieth century need to be a top priority. We are just now reaching a point of sufficient critical distance to enable their reconsideration, and little objective research has so far been done. Furthermore, many of these buildings are threatened due to continuing changes in liturgy, theology, and architectural preferences as well as the often poor quality of the post-war years and suburban expansion. In 2011 Robert Proctor, Lecturer in History of Architecture at the Mackintosh School of Architecture, Glasgow School of Art, undertook what is, to my knowledge, the most significant project to address these issues in the English-speaking world. 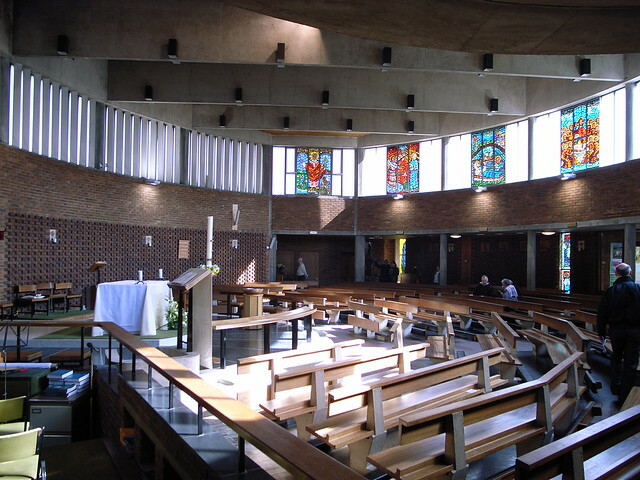 Funded by a grant from the Arts and Humanities Research Council of the UK, the project aimed to document and explore examples of Roman Catholic Church Architecture in Britain, 1955-1975. The churches of this time period reflect significant cultural developments including the post-war reconstruction, with its less optimistic version of modernism, and the implementation of liturgical reform. We are just beginning to see the fruit of this project, both academic and non-academic, some of which I would like to highlight here, along with some glimpses of the work. Greater detail concerning the purpose of the project and its ouput can be found on the project website. Among the academic outcomes are a series of conference presentations and an article in Architecture Research Quarterly entitled "Modern Church Architect as Ritual Anthropologist." These will culminate in the publication of book Church in Concrete, anticipated in 2014. A particularly admirable aspect of the work is the commitment to disseminating the findings of the academic research to a wider audience. One example of this is an article in the Catholic Herald entitled "Why we should prize our 'ugly' churches," written by Research Assistant Ambrose Gillick. Well worth reading, it takes one of the studied churches (St Gregory the Great, South Ruslip, image below) and succinctly illuminates its history. In the telling of its individual story and that of the people who built it, the building becomes less an anonymous part of a class of derided "ugly" buildings; it becomes a sympathetic hero whose triumphs we can admire while we learn from its shortcomings. The major publicly accessible outcome is an exhibition entitled "Churches in the Modern World." It presents a series of case study buildings illustrating the themes identified during the study: "the shift from tradition to modernity in church architecture and art; changes in liturgy and devotion, particularly with the Second Vatican Council; and the ways in which church architecture developed in the context of the modern city, with new ideas about the relationship of the Church to the modern world." Currently scheduled opportunities to experience the exhibition include: The Lighthouse architecture centre, Glasgow, 4 September to 4 October 2012; Liverpool Metropolitan Cathedral, 6 September to 6 October 2012; and St Chad’s Roman Catholic Cathedral, Birmingham, 9 October to November 2012. Other institutions and churches interested in hosting the exhibition should contact the project directly. One church included in the exhibition is St Mary, Leyland, which I would like to feature here briefly as it is not well-known. Moreover, it is a building which in its many pieces is immediately emblematic of the architectural solutions employed to address the liturgical and theological concerns at issue in 1964. ‘The Christian church is a building with a practical purpose: it is the meeting place of the assembly of Christians, met to celebrate the liturgy; it is the place where a person is received through baptism into the Church, or has his sins forgiven; it is a place where a Christian prays. Its exterior is only of subsidiary importance. … Leyland church … clearly is designed for what should occur inside; and the exterior does give the impression that here is a building in which something does happen’. Edward Courbould, ‘St Mary’s Priory Church, Leyland’, in Churchbuilding, December 1964 and Ampleforth Journal, June 1964.